The anticipated NERF war is finally HERE!!!! Little DinoEgg is so excited about this that he did not want to take his nap. I told him the rule is have his lunch, take a nap then we go to auntie Chris' house. He "defied" my order; 1st he took longer the needed to finish some sushi, then he refuse to nap. He went into the air conditioned room, lie down for 10mins and came out to ask me "If its already 2hours?". He made me blew my top that I just told him bluntly that we are not going over. He broke down n cry, begged me to go. I refuse to even look at or talk to him till dad asked him to go to nap immediately. Ok, why am I so insistent on that? I know very well that if he do not nap, he will be over tired later and will not enjoy himself fully instead he will be throwing tantrums or being petty on every thing. Anyway, while he is in the room napping I decided to have a shut eye on the sofa too. We reached Chris & Steve's house slightly later then the agreed time coz I over-napped. Quickly start dinner coz the kids were eager to start the game. 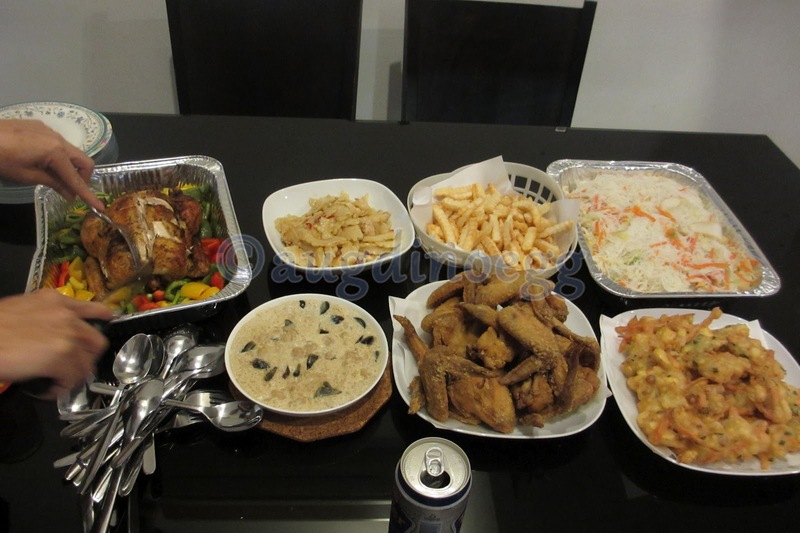 Its a simple but sumptuous meal! Love the stir-fried white bitter gourd with eggs!! Chris says this is "just for me" haha~ coz I keep saying in my FB status that I have "bitter gourd" cravings. Look at our table spread of food! The kids quickly finish their food and Little DinoEgg can't wait to start the war. He took out his NERF gun and started to shoot. We quickly finishes off the food, clear the table so that the kids can start the game. 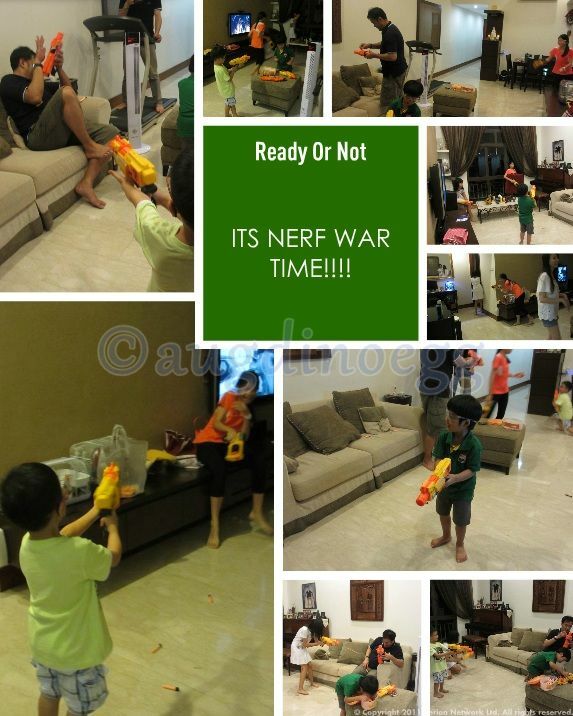 Soon its a "war zone" with squealing, screaming, shouting & war-crying soldiers running around the house. Bullets flying every where and the civilians aka those without guns (Chris only have 4 to go around so lucky 5; me, daddy, Renee, Chris & Steve are sitting out) are dodging them. It was fun to see the kids running amok, sets the adrenaline pumping even though I am not participating. An hour plus later the kids ran out of energy n every thing cool down except for you-know-who. He went around with his gun trying to shoot every one but they are just too tired to fight back. Instead they start shooting bullets up at the ceiling (lucky Chris' house has a high ceiling). After a while Renee, Mark & Iz has to leave coz Renee has to meet up with a client. The rest of us sat down and watch tv while cooling down as its quite late for any excitement. We left the house at 930pm feeling tired but happy. PS : Daddy's roast chicken was a success! The meat is tender n juicy, the asparagus & capsicums are crunchy n tasty. I foresee daddy will be using the oven to do more of his favourite grill & roast dishes. Too bad my photos are mostly blurr coz the kids RUN SO FAST!!! !